We have evangelised about the importance of analysing search data to help define user needs and measure the effectiveness of GOV.UK content. Unfortunately, one of the most important sources of data is drying up: what people searched for in Google to reach GOV.UK. In 2011, Google stopped providing search term data from anyone signed into a Google service. The most obvious issue is the rise of the ‘(not provided)’ keyword referrer in analytics. The Firefox browser also configured all searches to be https (secure) by default, further adding to the issue. Many of us will have seen ‘(not provided)’ prominent in the list of keywords. We added SSL encryption for our signed-in search users in 2011, as well as searches from the Chrome omnibox earlier this year. We’re now working to bring this extra protection to more users who are not signed in. To clarify, this is not a Google Analytics issue, it affects all analytics tools as Google is no longer passing the search term as part of the referral string. Now, search generates 73% of visits to GOV.UK, and the great majority of this comes from Google; 91%, compared to 4% from Bing and 2% from Yahoo! So we’re potentially losing a lot of useful data. For 24 September, we saw ‘(not provided)’ for 79% of visits from Google search. We’re still getting data from other search engines such as Bing and Yahoo!, but this still means 71% of all search visits had no keyword data. This is a change that impacts all sites that use search data to try to understand their users' needs. At GDS we thought it would be helpful to alert content designers about this and to offer some tips about work arounds and other data sources. Historical analytics data will still be available, so choose a time period earlier in 2013. There will still be some keyword data from Bing and Yahoo! and other minor search engines. To get a view of this data on its own, within Google Analytics, go to the organic keywords report and select advanced filter. Choose Matching RegExp: Bing|Yahoo (the ‘|’ is the pipe symbol). Then you should see the top search terms referring traffic from Bing and Yahoo! 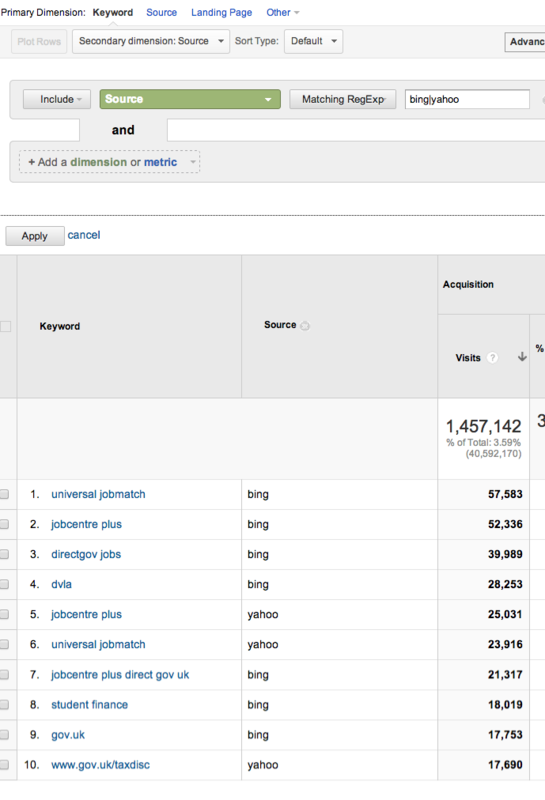 How to filter keywords referred from Bing and Yahoo! Look at the search terms people used in GOV.UK site search. To access site search data in Google Analytics, go to Content, then Site Search and select Search Terms to see search queries for the whole profile. To see search queries made on a specific page, go to Content, then Site Search and select Pages and then the page you are interested in. Use Google Trends to access valuable information about search term popularity and variations. See the search engine optimisation guidance in the GDS Content Principles. For specific projects, contact the GDS Product Analysts for further advice. Thanks for this really informative update. This may be a stupid question, but is it possible to track the internal searches (ie within the gov.uk site) to see what people are looking for once they reach the site? A very good question, Liz. I've updated the main post to show how. I wondered if you're thinking of trying to collect this kind of information through explicit surveys? Explicit responses and analytics data aren't the same, I know, but in the absence of some key analytics data...? Thanks for that Steph. I'll point this out to my user research colleagues. Surely this info is of limited use anyway. The real thing that you need to work out is when people are searching for something that should lead to your site but NOT finding it. Referring search terms (the data we're losing) is, in a sense self-referential, in that it's showing the terms people used to find you. But without that, you don't know which terms you didn't get traffic for. it's also very useful to analyse the landing pages for each term.